Sitting proud on the Chai Wan harbour front, Mercedes-Benz and Zung Fu–the exclusive retailer of Mercedes-Benz automobiles in Hong Kong and Macau–have just opened their new branding centre on Hong Kong Island. 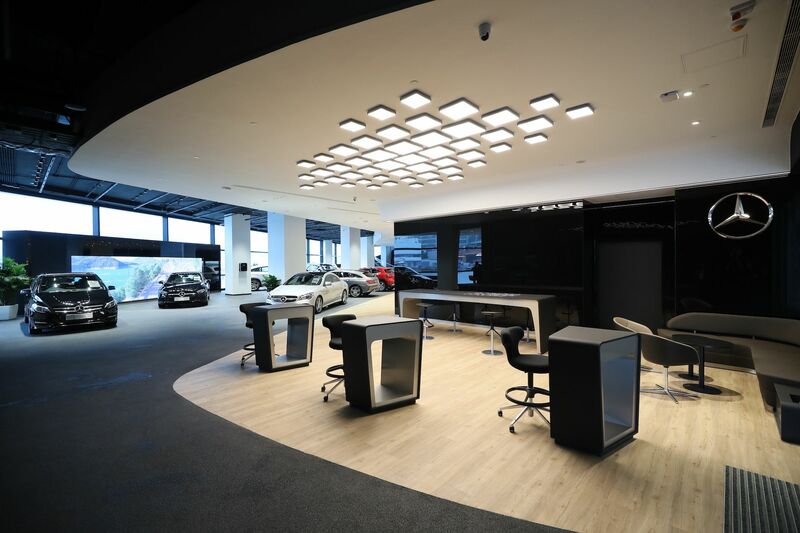 In a city where space is a premium, the multi-story building makes a global statement, combining a showroom, after sales workshop and car service centre that has been specifically designed for the whole family to enjoy. The brand centre has a strong digital focus with supersized television walls throughout the store and a new online booking system. Benjamin Birks, chief executive at Zung Fu Company Limited, explained how the guest experience should be relaxed, playful and fun–sentiments not commonly associated with purchasing a car. Gone are the days of the persistent car salesmen as Mercedes-Benz and Zung Fu have taken the car purchasing and after sales process to a new and more personable level. Making the most of the spectacular location, you'll have the opportunity to browse over 20 cars at a time, while technical experts are on-hand to talk purely about the specs (sans sales pitch). If heading for a car check-up or service, simply drive in and let the Car Jockey take the vehicle through its paces. Relax with a coffee or snack at the Bistro café, and enjoy close-up views of the latest Mercedes-Benz cars or the spectacular Hong Kong harbour. Kids can let off steam in the soft play area leaving the adults free to chat motors, while big kids can also have fun with the interactive driving-experience computer consoles. Frederik Gollob, President and CEO of Mercedes-Benz Hong Kong Ltd, sees the new branding centre as a “global benchmark for other stores to see how the customer experience is placed first." Focusing on maximum convenience, the centre features a same-day maintenance service, “Drop & Shop” at Causeway Bay, “Drop & Fly” at Hong Kong International Airport and a courtesy car on demand, plus exclusive customer events held on the spectacular terrace overlooking the harbour. The Mercedes-Benz branding centre showroom is open daily from 9am to 8pm, while the Service Centre is open from 8am to 7pm, Monday to Saturday (closed Sunday and public holidays).